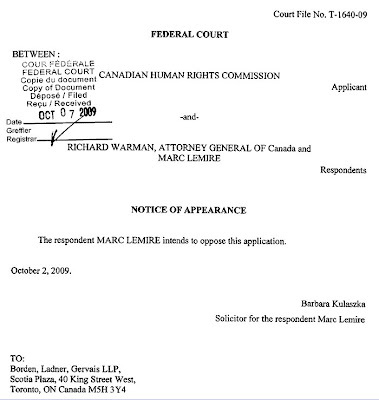 Earlier today Marc Lemire filed his "Notice of Appearance" at the Federal Court of Canada, and has let it be known that he intends to oppose the motion by the censorship fanatics at the Canadian "Human Rights" Commission. The CHRC is appealing the recent ruling by the Canadian Human Rights Tribunal, which found their internet censorship law to be unconstitutional and an affront to Canadian justice. As typical for the out of control and fanatical CHRC - they are willing to do and spend anything to keep their censorship franchise running.